"My favorite Thistle Farms product has always been the candle, and it will always be the candle. Everyday in the Circle, we light the candle for the woman who's still out there suffering in hope that they would find their way home. And I know now that someone lit the candle for me, for years before I ever made it to Thistle Farms." If you've ever met Ty, you know her choosing something that provides light as her favorite product isn't a surprise. Her smile and kind spirit brighten the day for everyone she encounters. Employed as a Manufacturing Manager, her tasks range from inventorying products and assigning projects based on needs for the day to different team members, training new women, and getting in the mix herself as well whenever she can. So, whenever you purchase our products, you're taking something with you that carries the light women like Ty infuse into everything they make. Ty describes her experience of being a Magdalene resident, graduate & survivor-leader as a gift beyond words. "In the beginning it gave me time to rest, to get myself together physically, mentally and emotionally. It also gave me hope, as well as helping me financially and giving me the resources I needed to take care of myself and my family," she says. Now that her experience has come full circle, Ty thinks it's "a thrill every time I see a new woman come through the door and knowing that they will receive the same blessings that I received." Holding "love for every single woman on the team," she is also thrilled to be part of all the expansions and growth that her department has seen through the last few years. Ty explains, "Since I've been in Manufacturing, we've added 7 new machines, including equipment that allows us to pour up to 1500 candles a day if needed, as opposed to doing 100 just by hand." In other words, production is great, and the team and their capacities "are growing everyday." For everyone who has supported Thistle Farms and helped make healing journeys like Ty's possible, she offers a sincere and heartfelt thank you: "Our supporters and all their contributions are changing lives. It allows us to buy new machinery and provide new employment opportunities. It allows us to bring in new women to the residential program. The love from our community partners and friends is just a blessing all around." I remember when Thistle Farms first bought the building on Charlotte Ave. It was shortly before the flood in Nashville in May 2010. When my husband Marcus drove me over to look at the location there was just a huge mud yard on the side of the building. But there was one Thistle growing up out of that mud, and I took it as a sign. 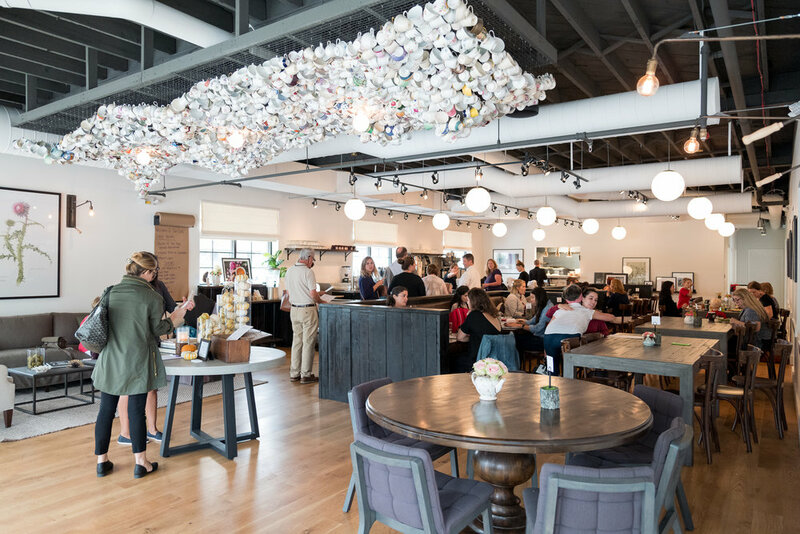 As I was entertaining a group at the Cafe recently (Thank you to Trish, the Cafe Events Manager) and Kristin, my Assistant) and bussing a few tables myself, all I could think about was what a well-oiled community Thistle Farms has become in every department. You can see professionalism, growth, charity and love exuding as effortlessly as the lavender wafting through the vents. That afternoon, there were groups of women laughing and talking during a break and even a group from the Nashville Sexual Assault Center learning about how to serve survivors. It is amazing to behold and I'm so proud to be a part of it. Everyone is a testimony to how love heals. From the oils that we lavish this world with to the amazing food to the kind words--it all is healing. Thank you to everyone who made that day possible. We're only hitting our stride.